Hi everyone! Thank you to all who played along with this week's color challenge. WE know this is a busy, busy time of year for everyone and we appreciate you taking the time to play along. Before we get to my choice for Headliner, let's see what caught the eye of the Design Team this week. 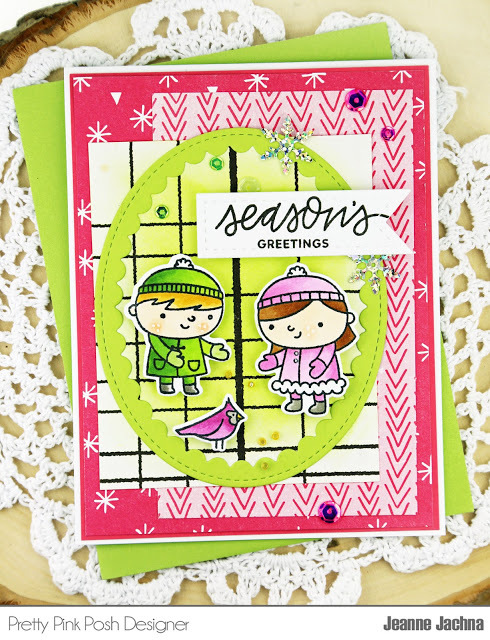 Jeanne's card showcased my color combo perfectly! The adorable little pair of children feeding the bird are colored beautifully. The layers and patterns are eye catching! 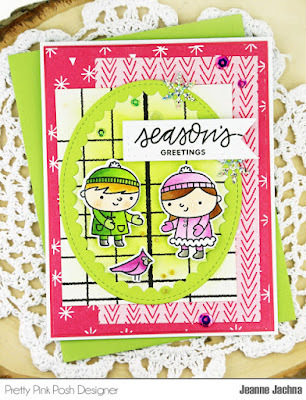 Congratulations Jeanne, your festive card is my Headliner this week! The Paper Players would like to share the story Ryland Ward, a 5-year old boy who survived the recent shooting at a church in Sutherland Springs, TX. He is still in the hospital…and his guardians say the one thing that is bringing him joy is opening Christmas cards. This is something we, as cardmakers, can help with! The address is in the article below. If you can support this effort, please post or let other cardmakers know. This story touched our hearts and we wanted to share it with all of you! No child should spend Christmas without their family. Thank you again to everyone for playing along with us. Congratulations to all our winners, please pick up your badges here. We are signing off to spend the holidays with family and friends but wishing each of you a happy holiday season! Please come back on January 7, 2018 for our first challenge of the new year! Joanne, thank you so much for choosing my card as your "cut above" - I'm honoured! Congratulations to all my fellow winners and to Jeanne for her headliner! Thanks so much for the pick - and congrats to all! Thanks also for sharing Ryland's story - I'll be sure to send a card! Congrats to all! So many beautiful cards! Thanks so much for featuring my card! So honored and thrilled! Thanks for sharing Ryland's story! Congrats to all! So many beautiful cards! Thank you Laurie for featuring my card! So thrilled and honored! Happy New Year to all! Thanks so much for the wonderful honor! Looking forward to making with you in 2018!